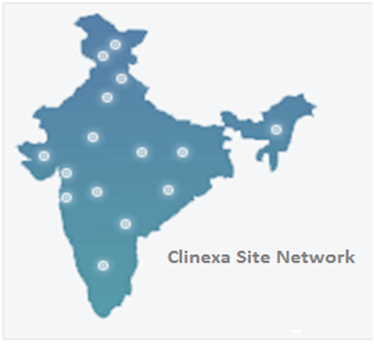 Clinexa Life Sciences Pvt Ltd is an ISO 9001:2008 Certified full-service Contract Research Organization (CRO) with extended clinical research capabilities having a distinguished investigator network throughout India offering comprehensive clinical research and site management services to Pharmaceutical and Biotechnology companies, Contract Research Organizations etc. Following the guidelines for re-engineering the clinical research enterprise as outlined in the NIH-Road Map for medical research we aim to contribute to accelerating and strengthening clinical research by adopting a systematic infrastructure that will better serve the evolving field of scientific discovery. Our mission is to provide smart and innovative solutions to all partners at competitive cost with customized services. It includes providing a highly trained and optimally managed clinical trials network for the growing industry in India and proving efficiency with implementation of a robust and successful performance metrics system. Our vision is to be a benchmark of excellence in CRO services by building a legacy of quality and trust & to develop a searchable inventory of integrated and managed site networks in India for the Clinical Research Industry. Clinexa offers services for phase II – IV clinical studies over a wide range of therapeutic areas with its network spread throughout India. We have an expanding network of dedicated, experienced, GCP trained, and quality conscious investigators throughout India.